ON a recent family trip to Caloundra, acclaimed foreign correspondent Sean Dorney shuffled down the beach to the surf, assisted by his wife and daughter, unable to raise his legs more than a few centimetres above the sand. “If you are walking behind me the tracks look as if a turtle has been scraping through the sand,” Mr Dorney said. Mr Dorney, 66, has lived an exceptional, active and varied career. He reported on Papua New Guinea and the Pacific as an ABC correspondent for four decades, was awarded an MBE, and even captained the PNG Rugby League national team, the Kumuls. Now he is living with motor neurone disease, which is severely limiting the movement of his limbs. “It’s exceptionally frustrating,” he said. “The good thing is there is no real pain involved. It’s just weakness of muscle. “The neurologist has me doing regular checks on my lungs to see that it is not progressing to the upper part of the body. “At the moment it is just the arms and legs. “Walking up stairs is a haul because I have to grab onto the railing and pull myself up. Mr Dorney’s diagnosis was confirmed about seven months ago, after a period of feeling weak and finding his physical abilities deteriorating. He’s optimistic, despite a specialist predicting he has three years to live. “My own neurologist thinks we don’t need to start the stopwatch going yet,” he said. “Generally the prognosis for anyone with motor neurone disease is three years. Some last ten, others a year and a half. Actually it was a bit of a relief to know what it was, and I had a determination not to let it cloud my mind and get depressed. “To my mind, to get depressed would only hasten any deterioration. Fortunately, from my father I have inherited eternal optimism. Mr Dorney makes regular trips to Brisbane’s Wesley Hospital for occupational therapy and infusions of Privigen, a drug aimed at boosting antibodies and reducing the rate of deterioration of the nervous system. Despite restricted movement, there’s no slowing down his passion for PNG and the Pacific, foreign affairs, and journalism. Family is also of prime importance – his wife Pauline, a Manus Islander who was the first female broadcaster on Radio Manus, and his two grown children Jervina and Xavier, and three grandchildren. 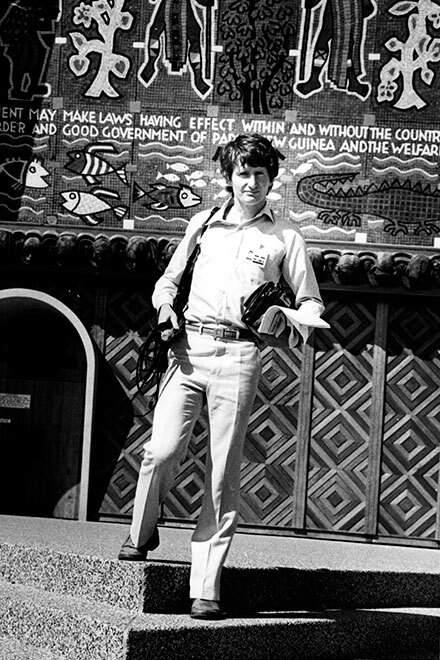 Four years ago, Mr Dorney retired from the ABC and Radio Australia after decades as a respected correspondent during which he wrote a history of PNG, won a Walkley Award for his reporting and became recognised as an expert on PNG affairs. He now works for the Lowy Institute as a non-resident fellow on its Melanesia program – helping to promote greater understanding, networking and guiding young Pacific leaders. “It’s a really good project in terms of letting young Australians and Papua New Guineans realise how many interesting and bright people there are just across the Torres Strait,” he said. 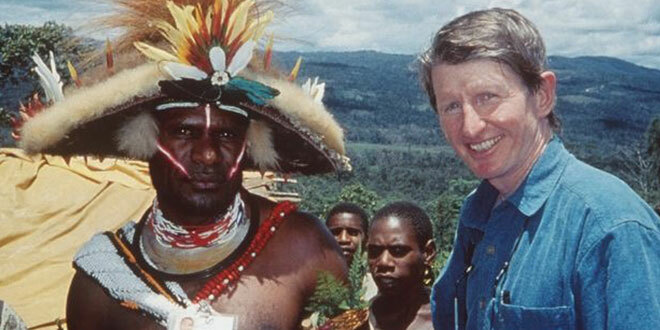 Sean Dorney: Out and about as an ABC journalist in PNG in 1989. Last year, Mr Dorney returned to PNG at the invitation of the Commonwealth Secretariat to be an observer at the country’s general election. “I just leapt at it. We spent three weeks before, during and after the voting,” he said. “I let them know about the motor neurone diagnosis. I just needed a bit of help. “On one day of voting in Lae, we went to nineteen polling stations – so I had to get in and out of a four-wheel-drive vehicle nineteen times. Mr Dorney laments Australian politicians’ lack of concern for the importance of Pacific affairs, and an ABC decision to close down Radio Australia’s shortwave service, which has served as a lifeline among island nations. “I just think we’ve dropped the ball when it comes to our responsibility in Papua New Guinea and the Pacific,” he said. “And I think the Australian media has lost the plot when it comes to where Australia is in the world. “This is a part of the world where we should have a major influence. But knowledge of Papua New Guinea and the Pacific is pretty pathetic. “As for the ABC, I’m just astounded that ‘we’ (he still calls the ABC ‘we’) have decided that because no one in Sydney listens to Radio Australia (on shortwave) no one anywhere else must listen to it. Mr Dorney said shortwave radio remained “hugely important”, despite an ABC decision that it was a “technology of the past and we don’t need it any more”. He was brought up in a strong Catholic household in Townsville, the fourth of six surviving children. His father was a highly respected surgeon, and one of the most decorated Australian doctors during the Second World War. His mother attended Mass every weekday morning as well as Sunday. “We went to novena each Saturday night as well as Sunday Mass,” he said. Mr Dorney also believes that Sister Rose, a Sacred Heart nun who taught him in primary school in Townsville, also taught his wife Pauline some years later in high school on Manus Island. Each of the Dorney boys attended Brisbane’s St Joseph’s Nudgee College, and in his own self-deprecating style Mr Dorney admits he lagged well behind older brother Kiernan and younger brother Stuart. “Kiernan, my elder brother, was good at sport and quite academic. But my younger brother Stuart was the academic star of our family,” he said. “Stuart came top boy in the whole of Queensland for the senior public examination. The results came out exactly the same day as I failed every subject in first year economics at uni. Despite his academic shortcomings, Mr Dorney excelled at rugby league, playing at halfback for James Cook University and later Brisbane Wests (rugby union), while his efforts as editor on the university newspaper earned him an ABC cadetship and “set me off on wings that eventually took me quite a distance”. In 1974 he was seconded to work for PNG’s fledgling NBC radio network and, during that time played rugby league for the Paga Panthers in the Port Moresby competition. A year later he was selected for PNG’s national team, the Kumuls, and went on to captain the side. “That was an absolute honour,” he said. Rugby league is a national obsession in PNG and, with eight million people and 800 languages, it also has a unique power to bring cultures together and bridge social gaps. “It certainly helped me as a journalist,” Mr Dorney said. “The fact that I’d been captain of the national rugby league team … it proved a huge source of recognition in PNG. Mr Dorney chuckles at his many moments of notoriety – including a remark by one Australian foreign minister during a Pacific visit that Mr Dorney was far more recognisable than he was to other leaders and VIPs. There were plenty of journalistic highlights during his time as an ABC foreign correspondent. In 1998, he reported the Aitape tsunami, which claimed 2500 lives, and earned a prestigious Walkley Award. “In terms of spectacle, nothing can compare with flying over two exploding volcanic vents in the Rabaul volcanic eruption (in 1994). That was just really something,” he said. Mr Dorney could draw strength from that statement as he faces his latest life struggle – motor neurone disease – with his wife and family by his side. “Pauline’s been an absolute treasure. Nothing but incredible support. And she’s facing this with extreme stoicism,” he said. 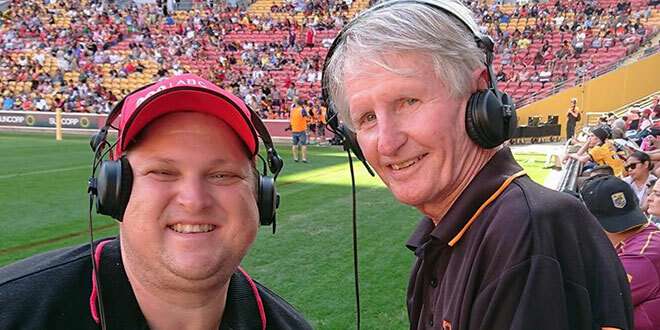 Brisbane’s Western Districts Rugby Football Club will host a Sean Dorney tribute dinner on February 24 with the proceeds going to motor neurone disease research. For bookings contact Srahearn@hotmail.com or go to https://www.trybooking.com/345668.